Deze vragen en antwoorden zijn gebaseerd op de ‘Frequently Asked Questions’ van de Engelse Tolkien Society. Ze zijn dus in de Engelse taal opgesteld. Levert dit problemen op dan kunt u ons een e-mail sturen met uw vraag. Dan proberen wij deze zo snel mogelijk te beantwoorden. John Ronald Reuel Tolkien was born of English parents at Bloemfontein, South Africa on Jan. 3; 1892 and died in England on Sept. 2, 1973. His entire childhood was spent in England, to which the family returned permanently in 1896 upon the death of his father. He received his education at King Edward’s School, St. Philip’s Grammar School (both in Birmingham) and Oxford University. After graduating in 1915 he joined the British army and saw action in the Battle of the Somme. He was eventually discharged after spending most of 1917 in the hospital suffering from trench fever. It was during this time that he began ‘The Book of Lost Tales’. From an early age he had been fascinated by language, particularly the languages of Northern Europe, both ancient and modern. Tolkien’s academic positions were: staff member of the ‘New English Dictionary’ (1918-20), Reader, later Professor of English Language at Leeds (1920-25); Rawlinson and Bosworth Professor of Anglo-Saxon at Oxford (1925-45); and Merton Professor of English Language and Literature (1945-59). His principal professional focus was the study of Anglo-Saxon (Old English) and its relation to Iinguistically similar languages (Old Norse, Old German, and Gothic). Moreover, Tolkien was an expert in the surviving literature written in these languages. Indeed, his unusual ability to simultaneously read the texts as linguistic sources and as literature gave him perspective into both aspects. From his affinity for language came not only his profession but also his private hobby, the invention of languages. He was more generally drawn to the entire ‘Northern tradition’, which inspired him to wide reading of its myths and epics and of those modem authors who were equally drawn to it, such as William Morris and George MacDonald. His broad knowledge inevitably led to the development of various opinions about Myth, its relation to language, and the importance of Stories, interests which were shared by his friend C.S. Lewis. All these various perspectives: language, the heroic tradition, and Myth and Story (and a very real and deeply-held belief in and devotion to Catholic Christianity) came together with stunning effect in his stories, first the legends of the Elder Days which served as background to his invented languages, and later his most famous works: ‘The Hobbit’ and ‘The Lord of the Rings’. What does it mean when people (or Tolkien himself) speak of him as having been the ‘editor’ of ‘The Lord of the Rings’? The fiction Tolkien sought to maintain was that ‘The Lord of the Rings’ (and ‘The Hobbit’ and ‘The Silmarillion’) were actually ancient manuscripts (written by Frodo and Bilbo, respectively) of which he was merely the editor and translator (a situation identical to much of his scholarly work). He never stated this directly but it is implicit in the way in which many sections of ‘The Lord of the Rings’ outside the story are written. Did the events in ‘The Lord of the Rings’ take place on another planet? Was the northwest of Middle-earth, where the story took place, meant to actually be Europe? Yes, but a qualified yes. There is no question that Tolkien had northwestern Europe in mind when he described the terrain, weather, flora, and landscapes of Middle-earth. This was no doubt partially because NW Europe was his home and therefore most familiar to him and partially because of his love for the ‘Northem tradition’. However, the geographies simply don’t match. 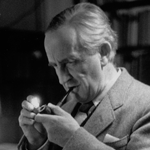 This was the result not so much of a deliberate decision on Tolkien’s part to have things so but rather a side-effect of the history of the composition: the question did not occur to him until the story was too far advanced and the map too fixed to allow much alteration. Was the Shire meant to be England? In this case, the balance between ‘actually was’ and ‘was based upon’ is entirely tipped towards the latter. There is no hint that the Shire was in any sense supposed the be the country now called England in an ancient state. On the other hand, there is plainly a very strong resemblance between the Shire and the rural England of about a century ago. More precisely, the Shire plainly could not be England in any literal sense: England is an island, and even changes in ‘the shape of all lands’ (‘Fellowship of the Ring’, prologue) is insufficient to explain such a discrepancy (especially since even the westernmost part of the Shire was some 200 miles from the Sea). Nevertheless, the Shire was more exactly based on England than any other part of Middle-earth was based on any part of our world: the climate, place-names, flora and fauna, terrain, food, customs, and the inhabitants themselves, were all English. In effect the Shire was an idealized version of the rural England of Tolkien’s childhood. Finally, great care must be taken not to confound the idea of the Shire’s having been based on England with a concept found in Tolkien’s earliest writings, that Tol Eressëa (Elvenhome) eventually became England. This appeared during his early work on ‘The Book of Lost Tales’, which eventually evolved into ‘The Silmarillion’. Very probably it had been supplanted even before he stopped work on ‘The Lost Tales’ (1920). In any case, it had long since been abandoned by the time ‘The Lord of the Rings’ was begun in 1937, and plays no part in the ‘history’ of Middle-earth as presented in ‘The Lord of the Rings’, ‘The Silmarillion’, ‘The Hobbit’, etc. Why is Tolkien’s work, ‘The Lord of the Rings’ in particular, so difficult to translate into other languages of our world? Because his interest in, skill whith, and love of language are manifest at every level and indeed in almost every word of ‘The Lord of the Rings’, thereby producing a result difficult if not impossible to duplicate. What were the changes made to the chapter ‘Riddles in the Dark’ in ‘The Hobbit’ after ‘The Lord of the Rings’ was written, and what motivated them? In the original 1937 edition of ‘The Hobbit’ Gollum was genuinely willing to bet his ring on the riddle game, the deal being that Bilbo would receive a ‘present’ if he won. Gollum in fact was dismayed when he couldn’t keep his promise because the ring was missing. He showed Bilbo the way out as an alternative, and they parted courteously. As the writing of ‘The Lord of the Rings’ progressed, the nature of the Ring changed. No longer a ‘convenient magical device’, it had become an irresistible power object, and Gollum’s behaviour now seemed inexplicable, indeed, impossible. In the rough drafts of the ‘Shadow of the Past’-chapter Gandalf was made to perform much squirming in an attempt to make it appear credible, not wholly successfully. Tolkien resolved the difficulty by re-writing the chapter into its present form, in which Gollum had no intention whatsoever of giving up the Ring but rather would show Bilbo the way out if he lost. Also, Gollum was made far more wretched, as befitted one enslaved and tormented by the Ruling Ring. At the same time, however, Bilbo’s claim to the Ring was seriously undercut. There are two issues involved, well summarized in the ‘Prologue’: ‘The Authorities’, it is true, differ whether this last question was a mere ‘question’ and not a ‘riddle’, but all agree that, after accepting it and trying to guess the answer, Gollum was bound by his promise’. Thus, it was Bilbo’s winning of the game that was questionable. Given that he had in fact won, albeit on a technicality, he was fully entitled to the prize, which, in the old version, was the Ring. In the new version, however, he had no claim to the Ring at all, whether he had won or not, because the Ring was not the stake of the game. The textual situation thus reached was that there now existed two versions of the episode. Tolkien deftly made this circumstance part of the story by suggesting that the first time around Bilbo was lying (under the influence of the Ring) to strengthen his claim. Yes, beyond question. There were three statements to this effect. The first, from the ‘Prologue’, is probably less definite because it was intended to be the editor speaking. Letters, footnote p. 158/#131 ’The Hobbits are, of course, really meant to be a branch of the specifically human race (not Elves or Dwarves), hence the two kinds can dwell together (as at Bree), and are called just the Big Folk and Little Folk. They are entirely whithout non-human powers, but are represented as being more in touch whith ‘nature’ (the soil and other living things, plants and animals), and abnormally, for humans, largely free from ambition or greed of wealth. Only slightly. Tolkien described Bilbo for purposes of illustration in this letter to Houghton Mifflin (c. 1938). Note that Tolkien’s use of the word ‘elvish’ here refers to the elfs of popular folklore, who were often pictured whith pointed ears. The Elves of Middle-earth (except for the Silvan Elves in ‘The Hobbit’) were at the time of this letter known to only a few people. When was Bilbo and Frodo’s Birthday? To what date on our own calendar does it correspond? The date on the Shire calendar was September 22 (‘Fellowship of the Ring’, chapter 1). Both the different definitions of the months and the different correlation of their calendar with the seasons – the summer solstice fell on Mid-year’s Day, the day between June and July, not on June 21 as on our calendar (‘Return of the King’, appendix D) – must be taken into account.. The discrepancy in September is found to be 10 days, giving September 12 on our calendar as the equivalent date. In ‘Appendix D’ Tolkien gives detailed information about long-term inaccuracies in the Shire Reckoning, which they dealt with differently than we do. Based on this, it is possible to conclude that the Shire Reckoning at the time of the story had accumulated either two days or four days of error, depending on how careful the Hobbits were about making long-term corrections, which we aren’t told. This result would make the equivalent date either September 14 or September 16, but other considerations raise questions about the accuracy of such calculations, so September 12 is probably the most straightforward choice. Did Elves have pointed ears? They were somewhat pointed; more so than human ears, at any rate. The only place this matter is addressed directly is in ‘The Etymologies’, published in ‘The Lost Road’, where the element ‘las’ it is shown that the Quenya (Q) and Noldorin (N) words for ‘leaf and ‘ear’ are the same. Who were the Istari (Wizards)? The Istari (Wizards) were Maiar (spiritual beings of lower ‘rank’ than the Valar) sent to Middle-earth by the Valar in human form as Messengers to help in the struggle against Sauron: the term ‘incarnate angel’ is approximately correct. Being incarnated limited their power, and intentionally so, because their mission was to organize the resistance and to inspire the peoples of Middle-earth to help themselves, not to do the job for them. Their main temptation, then, was to try to speed up the process by dominating other free wills, a principle reason for their mission was to prevent such actions by Sauron. It was said that there were Five Wizards in the Order, but only three came into the story: Saruman (‘Man of Skill’) the White [Sindarin: Curunír (‘Man of Skill’); Quenya: Curumo]; Gandalf (‘Elf of the Wand’) the Grey (later the White) [Sindarin: Mithrandir (‘Grey Pilgrim’); Quenya: Olórin]; Radagast the Brown [Quenya: Aiwendel]. Gandalf was the only one who remained true to his mission, and in the end succeeded in bringing about Sauron’s defeat. He was also the keeper of the Elven Ring Narya, the Red Ring (the Ring of Fire). Very little is known about the other two. No names given them in Middle-earth are recorded, just the title Ithryn Luin, ‘The Blue Wizards’ (for they were clad in sea-blue). Their names in Valinor were ‘Alatar’ and ‘Pallando’. Tolkien said that he knew ‘nothing clearly’ about them. Radagast was said to also have failed his mission, but it’s tempting to think that his ‘failure’ was not as bad as that of the others. Radagast certainly never became evil. His mission may have been not just to relate to wild creatures but also to build bridges between them and Elves and Men. He did, in fact, have his friends the birds gather much information, but since they were reporting to Saruman as the head of the Council that wasn’t altogether helpful. On the other hand, it has often been suggested (though there is no direct textual evidence of any kind) that the way Eagles kept showing up at opportune times may have been partially his work. We know nothing of what happened to Radagast after the end of the Third Age. It seems conceivable, though, given the more ambiguous nature of his failing, that he might have been allowed back to Valinor eventually. They are different names for the same race of creatures. Of the two, ‘Orc’ is the correct one. This has been a matter of widespread debate and misunderstanding, mostly resulting from the usage in ‘The Hobbit’ (Tolkien had changed his mind about it by ‘The Lord of the Rings’, but the confusion in the earlier book was made worse by inconsistent backwards modifications). It was part of a general trend away from the terminology of traditional folklore (he felt that the familiar words would call up the wrong associations in the readers’ minds, since his creations ware quite different in specific ways). For the same general reasons he began calling the Deep Elves ‘Noldor” rather than ‘Gnomes’, and avoided ‘Faerie’ altogether. On the other hand, he was stuck with ‘Wizards’, an ‘imperfect’ translation of Istari (‘the Wise’), ‘Elves’, and ‘Dwarves’. He did say once that he would have preferred ‘dwarrow’, which, so he said, was more historically and linguistically correct, if he’d thought of it in time. This question has been a widely debated, sometimes far too vehemently. Part of the difficulty is the complexity of Tom’s literary history. Tom was originally a doll (with blue jacket and yellow boots) owned by Tolkien’s son Michael. The doll inspired a story fragment, such as he often invented for his children’s amusement. That fragment was in turn the basis for the poem ‘The Adventures of Tom Bombadil’, published in 1933, which also introduced Goldberry, the barrow wights, and Old Man Willow (the poem was the source of the events in Chapters 6 through 8 of Book I). In a contemporary letter (1937) Tolkien explained it. Letters, p. 26/#19 ’Tom was meant to represent ‘the spirit of the (vanishing) Oxford and Berkshire countryside’. Tolkien introduced Tom into ‘The Lord of the Rings’ at a very early stage, when he still thought of it as a sequel to ‘The Hobbit’, as opposed to ‘The Silmarillion’. Tom fits the original (slightly childish) tone of the early chapters (which resembled that of ‘The Hobbit’), but as the story progressed it became higher in tone and darker in nature. Tolkien later claimed that he left Tom in, he decided that however portrayed Tom provided a necessary ingredient. Some very cogent reasons are produced in the letters 144 & 153. He was a Maia (the most common notion). The reasoning here is plain: given the Middle-earth cast of characters as we know it, this is the most convenient pigeonhole in which to place him (and Goldberry as well); (most of the other individuaIs in ‘The Lord of the Rings’ with ‘mysterious’ origins: Gandalf, Sauron, Wizards, and Balrogs did in fact turn out to be Maiar). He was IIúvatar. The only support for this notion is on theological grounds: some have interpreted Goldberry’s statement to Frodo (F: ‘Who is Tom Bombadil?’ G: ‘He is.’) as a form of the Christian ‘I am that I am’, which really could suggest the Creator. Tolkien rejected this interpretation quite firmly. T.A. Shippey, in ‘The Road to Middle-earth’, and others have suggested that Tom is a one-of-a-kind type. This notion received indirect support from Tolkien himself. There are scattered references to ether entities which seem to fall outside the usual picture. Whichever of these is correct, Tom’s function inside the story was evidently to demonstrate a particular attitude towards control and power. Why did Tolkien fail to publish ‘The Silmarillion’ during the eighteen years which followed the publication of ‘The Lord of the Rings’? Tolkien’s unmethodical habits of revision had made the manuscripts chaotic. It seemed impossible to make everything consistent. Characters introduced in ‘The Lord of the Rings’ had to be worked in. Beyond these detailed questions, he contemplated many alterations, even to fundamental features of his mythology. In ‘The Lord of the Rings’ his references to the older legends of the First Age helped produce the strong sense of historical reality. In ‘The Silmarillion’, which told the legends themselves, this method wouldn’t be available. ‘The Lord of the Rings’ had been basically novelistic, presenting the story sequentially from one character or another’s point of view. But ‘The Silmarillion’ was and was meant to be a bundle of tales which had more in common with the ancient legends he studied than with ‘The Lord of the Rings’. He feared that if he presented it as an annotated study of ancient manuscripts that probably many readers would have difficulty enjoying the tales as stories. He feared (correctly) that many people expected another ‘Lord or the Rings’, which ‘The Silmarillion’ could never be. Was Glorfindel of Rivendell (whom Frodo met) the same as Glorfindel of Gondolin, who was slain fighting a Balrog? This has been a matter of great controversy. It was unplanned by Tolkien, and therefore was something he had to decide after the fact. The only direct information in any of the books is a comment by his son Christopher. History of Middle-earth VI ‘The Return of the Shadow’ Pages 214-215: [The use of Glorfindel] in ‘The Lord of the Rings’ is one of the cases of the somewhat random use of the names found in the older legends, now referred to as ‘The Silmarillion’, which escaped reconsideration in the final published form of ‘The Lord of the Rings’. He came to the conclusion that Glorfindel of Gondolin, who fell to his death in combat with a Balrog after the sack of the city (History of Middle-earth II. 192-4, IV. 145), and Glorfindel of Rivendell were one and the same: he was released trom Mandos and returned to Middle-earth in the Second Age. Because he doesn’t provide any direct quotes, rather he merely describes a ‘conclusion’ that his father eventually ‘came to’, the matter reduces to a question of how much one trusts Christopher, and whether one supposes that he might attach too much importance to a casual statement. The majority of readers appear to accept that this was indeed a thoughtful conclusion that Tolkien reached only after long deliberation (we do know that he and Christopher discussed the matter of Middle-earth often). A significant minority continue to reject it.